Your customers are at the heart of everything you do. You manufacture for them, you market for them, you sell to them, and you want to see them come back again and again. So once you’ve got customer loyalty and preference, how you do acquire more clients? B2B word-of-mouth is your greatest sales tool. One of the best and immediate ways to obtain testimonials and feedback is through social media. Let’s check out an example of a B2B company that is using social to meet their goals. 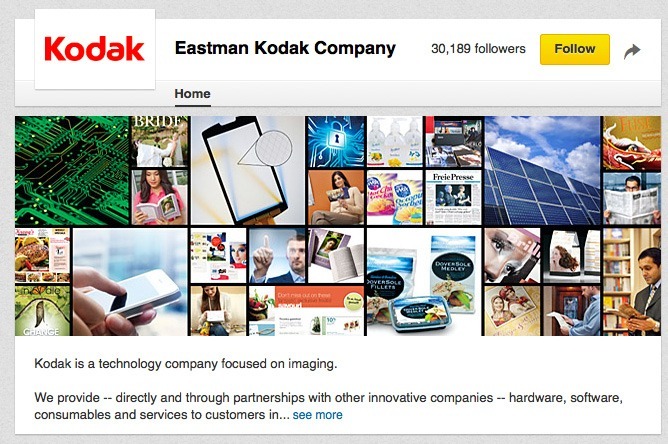 Once known for cameras and photo paper, Eastman Kodak Company transformed itself into a technology company focused on imaging for businesses to meet demands of the new digital age. In September 2014, the company and its subsidiaries emerged from a 20-month Chapter 11 reorganization. We provide — directly and through partnerships with other innovative companies — hardware, software, consumables and services to customers in graphic arts, commercial print, publishing, packaging, electronic displays, entertainment and commercial films, and consumer products markets. With our world-class R&D capabilities, innovative solutions portfolio and highly trusted brand, Kodak is helping customers around the globe to sustainably grow their own businesses and enjoy their lives. You can also see the content shift within their Facebook page. Despite the shift in their focus, it’s still all about customer experience – and who better to talk about their experience but customers themselves. Kodak knows the value in social media. In 2010, the company appointed its first CLO – Chief Listening Officer. While in her role, Beth LaPierre likened herself to an air traffic controller; rather than managing the safe and efficient flow of air traffic, LaPierre managed the safe and efficient flow of social media data. With more than 300,0000 new mentions of “Kodak” each month for both its consumer and B2B business, LaPierre put into place strategies, processes and technologies to handle the workload. A great social media campaign is always relevant – so keep your content current and fresh. Listen to your customers and engage with them. They’re most likely to post something within two weeks of purchasing. How can you improve your social media and get your customers talking about you? Identify your audience, your objectives and metrics for success. Evaluate social media tools (software, agencies, vendors). Give great visuals. Excel charts and PowerPoint presentations are fine, but if you can pull your data into Illustrator or Photoshop, you’re much more likely to get your point across. Kodak’s social media channels on YouTube, Facebook and Twitter are a medium for customers and fans to contact for help or to ask questions. With their strong B2B focus, their greatest social reach is through LinkedIn where they now boast over 30,000 followers. Kodak’s websites feature both consumer and B2B testimonials detailing situations where the company really went above and beyond. LaPierre couldn’t get enough of customer feedback. Is your company taking advantage of all the social marketing opportunities available? Check out five more case studies and learn replicable marketing strategies from leading manufacturers. Get this step-by-step guide for creating a workable content and social marketing strategy for your manufacturing enterprise— you don’t have to be an industry giant to do it. No matter what industry you’re in, the competition is heating up, so traditional marketing methods simply aren’t enough anymore. Get ahead of the curve.